We often go to Phillip Island to bring our guests to the Penguin Parade, but since we’ve seen the penguins so often, it isn’t worth it to buy a ticket for ourselves. So instead, we take a little detour to the main town centre (Cowes) of Phillip Island. One of the few restaurants/things to do at night is the Lone Pine Bistro, and the Phillip Island RSL that are connected. I was quite surprised that they close early, I think it was 8:30 but the RSL/Pokies still remains open. Luckily we got in time and was one of the last few orders before the kitchen closed. I ordered the Lamb Burger with Chips and Salad. I was a tad bloated because I ate some Korean Corn Chips (Delicious) an hour or so before, but after tasting this. I couldn’t resist. I loved the burger, it had a slice of beetroot, well seasoned lamb mince patty, salad and cheese. It was a traditional combination but nicely cooked. The bread was crispy but soft on the inside, and overall the burger just hit the spot. Usually you’d find the burger to be dry, but this one was perfectly cooked. The salad had a nice tanginess that helped with the fattiness of the chips. The chips required tomato sauce to go down, it was a tad too dry with the potato having that chalky texture. On the positive side, it was nice and crunchy. I was pleasantly surprised with RSL/Bistro food after eating this, usually “pub” food can be overcooked and quite pedestrian. Although this doesn’t stray too far from the norm, what it does, it does well. Their Roast Beef and Vegetables dish wasn’t as fantastic as their Burger. Most places cannot serve perfectly cooked carved beef or turkey. I think it’s because they cook the entire beef/turkey/pork and just leave it to “keep warm”. So eventually the meat just loses all it’s juices and overcooks. This is what happened here. 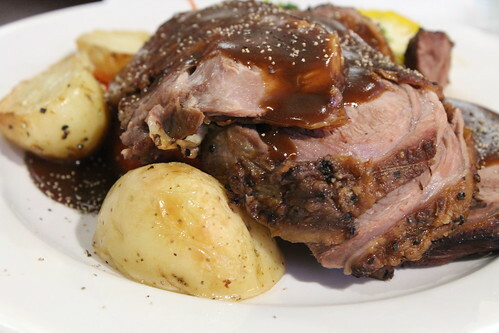 The meat is quite tough, and the gravy tries its best to assist with the dryness, but ultimately cannot overcome the fact that the meat is severely overcooked. On the plus side, potatoes are always good, and the vegetables served are pleasant enough to eat. I’d be disappointed if I was served this, and it’s a stark difference to how well cooked the Lamb Burger was. I can see why it was disappointing, and it would definitely be difficult to cook the meat perfectly all things considered. Probably would be better if they served a steak but alas this isn’t what they offered. 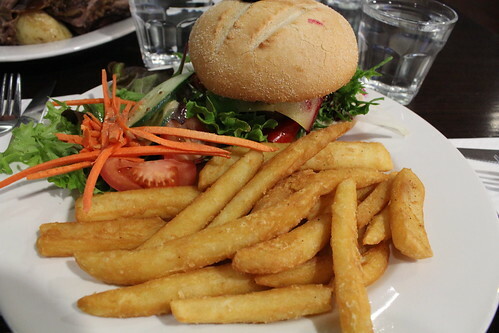 Lone Pine Bistro serves traditional Australian food, they also have a wide range of desserts and cakes. So if you’re travelling to see the Penguins, a stop here for some tucker isn’t a bad idea at all.